Inge Oliver was born on 18 December 1947 on the mission station at Bethel near Lichtenburg. She was educated at Hermannsburg School, KwaZulu-Natal and studied Botany, Zoology and Fine Art at the University of Cape Town. During her university vacations she worked at the National Herbarium, Pretoria. Her first post was as Herbarium Assistant in the Government Herbarium, Stellenbosch, where she met and married Ted Oliver. They had a son, Thomas, and two daughters, Tessa and Nicola. Inge was also a botanical artist. 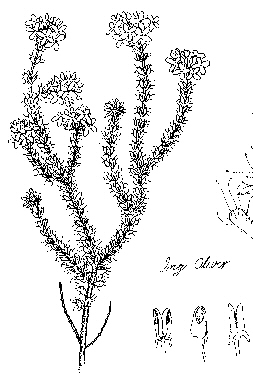 She discovered a new Erica, which was named after her, Erica ingeana. 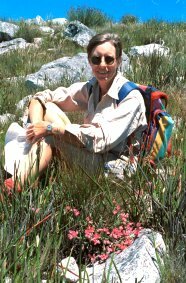 At the time of her death she worked with her husband as a contract research botanist in the Compton Herbarium, Kirstenbosch, on the genus Erica. Inge died on 7 July 2003 in Stellenbosch. The photo shows Inge at her favourite Erica site on Pilaarkop, where on her request her ashes were scattered.